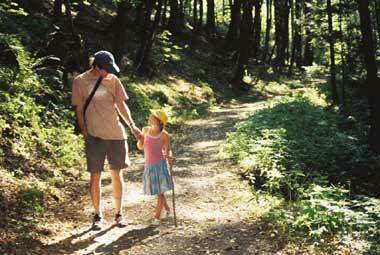 Take a break with your child(ren), for a shared experience in nature. Retreats are designed for both young and young at heart, and focus on fun activities together. You will be close to nature, amidst forests and meadows, where medieval castles wait to be explored, recalling stories of magic and glory. In addition to exploring, you will be hiking, riding & swimming. 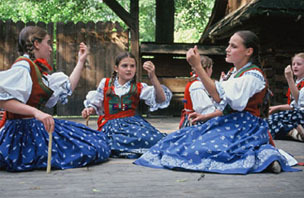 Other activities will emphasize folk traditions and enhance multicultural understanding. Natural Protected Zone, where it is still possible to find many examples of traditional lifestyles. Points of interest will be the small towns and villages, with an emphasis on 19th century music and customs. Lodging will be in characteristic old farm houses and mills. Natural Protected Zone in Eastern Moravia. Here you can find examples of a proud people, exempted from farm labor in exchange for their services as boarder guards. This is the land of legendary giants and defiance. These mountains also offer one of the most dramatic landscapes in the Czech Republic. 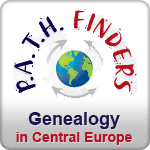 Come explore the folk art, architecture, and customs of the Wallachian culture with us. - Group sizes are limited to a minimum of 6, and a maximum of 12 participants, from 6 years of age. 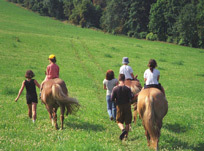 - Parents may participate on a part time basis for $145 / day (includes lodging & meals / no transport).